You can add categories on the fly from within your post editor, using the “+ Add New Category” link in the “Categories” box. 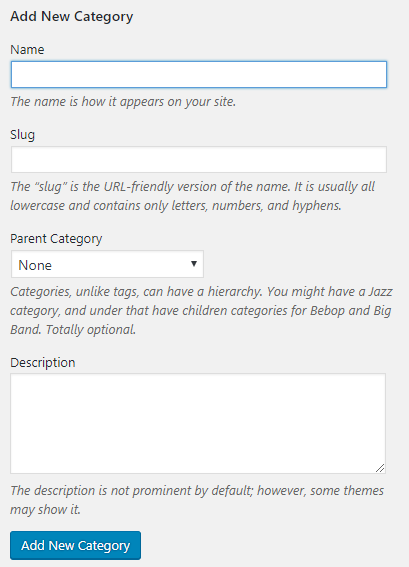 However, to edit (including change parent setup) or delete categories, navigate to “Posts>Categories”. From here, you can also add new categories. Edit existing categories in your categories list. The “Quick Edit” allows you to update category title and slug. “Edit” opens up the category details and allow for some more edits, such as to the parent setup (e.g. add or remove a parent category). You’ll notice the above image does not have a “Delete” option. This is because it is set as the default category, which cannot be deleted. 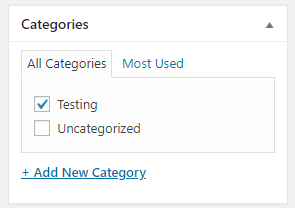 You can delete any categories that are not the default category. 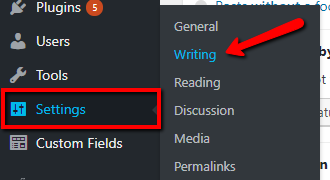 To change which category is the default, navigate to “Settings>Writing”. Here you can set the default category. Now you can go back to “Posts>Categories” and delete the category that is no longer the default. Note: If you delete a category that contained posts, those posts will now fall into your default category (if it is not also in other categories).